Gastroenterologists, Internists, Hepatologists, family physicians as well as related advanced-practice providers and nurse specialists. CLICK HERE to view the program agenda, seminar faculty, and venue information. CLICK HERE to view the venue webpage. This activity has been planned and implemented in accordance with the accreditation requirements and policies of the Accreditation Council for Continuing Medical Education (ACCME) through the joint providership of the University of Louisville School of Medicine and SC Liver Research Consortia. The University of Louisville School of Medicine is accredited by the ACCME to provide continuing education for physicians. Nurses - This program has been approved by the Kentucky Board of Nursing for 7.1 continuing education credits through University of Louisville Hospital, provider number 4-0068-7-18-1085. The Kentucky Board of Nursing approval of an individual nursing education provider does not constitute endorsement of program content. Requests for cancellation must be submitted to cmepd@louisville.edu at least seven (7) days prior to the program. Such requests will receive a full refund less a $20 processing fee. 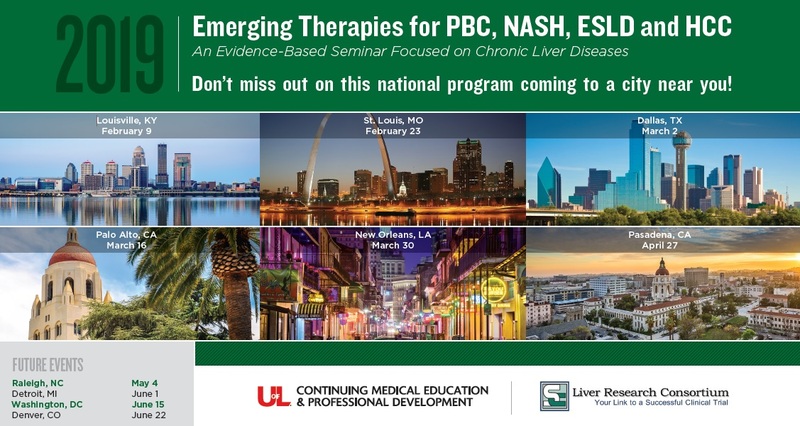 We thank our supporting and exhibiting companies for their participation in the Emerging Therapies for PBC, NASH and ESLD and HCC Seminar Series 2018-2019!